Honestly this is one of my favorite lubes. It's cheap and works well. It doesn't last forever like silicone lubes, but you can't use silicone lubes with most condoms and many toys; so it's almost overrated. I have heard other people saying astro-glide is better, but I haven't seen a difference between the two. 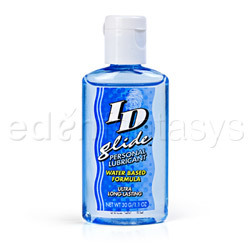 Since ID is typically one of the cheaper lubes, and it works just as well, it is the one I will get when I need more. Will get tacky and probably need more for one use. I like that this comes in various sizes. I have the 17.5 ounce one, and have had it for quite some time. I've had it for a few years and it's kept it's consistency and what not. I will say that it is hard to pump when you have slippery fingers from already using it so I tend to also have a smaller bottle that I will transfer it into. It smells and feels like most waterproof lubricants; and like most you may need to use more as it can get tacky after some time. Cleaning is easy; you can wash up with soap and it will come out of sheets easily by just throwing them in the wash. I have never had a problem with this staining anything, but I would recommend a shower after using it instead of just washing up as it can get really tacky and has a recognizable smell even if it claims to be odorless. I like that this is water based because you don't have to worry about hurting your toys or condoms. If you are sharing a toy, condoms are a good idea anyway. Silicone lubes will damage silicone toys and condoms. Seeing as silicone toys tend to be a bit more expensive I wouldn't want to risk damaging them I will say that washing it off prior to going down on your partner is a good idea. It doesn't taste awful, but I wouldn't say it has a pleasant taste. I know that it says it's tasteless and odorless, but everything has a taste and a smell typically, it's just mild. However it is still a distraction. This does not make it any less worthwhile. It does it's job and does it well and is one of my favorite less expensive lubes. This is the lube I've used off an on for like the last 10 years. It's nice that it comes in a large size (I bought the 17.5 oz) with a pump. You don't have to go out an buy it very often since it doesn't go bad. I typically have also gotten a smaller one and refill it for appearance's sake instead of saying oh go get the massive bottle of lube in the drawer. ID glide is still a favorite of mine. I like that I've had no issues with the bottle leaking like I've had with Astroglide. It's nice to not have to clean up after the bottle whenever I want to use a lube. It's funny the things you don't think of as perks until you've run into problems you hadn't contemplated before. Either way, I think this is a good all-purpose water-based lube, and I would get it again. Why is this product not sold in the same types of containers? I received a sample and want to make sure it's the real thing before writing a review. Thank you for viewing ID glide – lubricant review page!